A Quaker Meeting for Worship creates a space of gathered stillness. We come together where we can listen to the promptings of truth and love in our hearts, which we understand as rising from God. Our meetings are based on silence: a silence of waiting and listening. Most meetings last for about an hour. Victorian Friends Centre closed at the end of February 2019 for four months for the purpose of renovations. 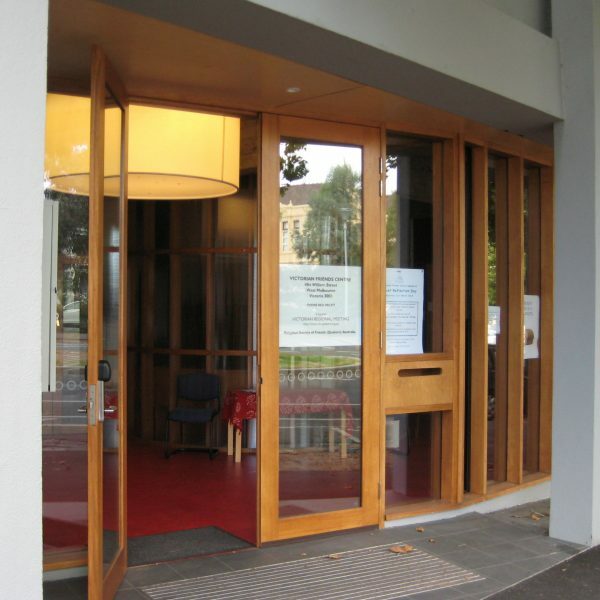 While renovations happen, Melbourne City Recognised Meeting, which normally meets at the Centre, now meets weekly at The Welsh Church, 320 Latrobe Street, Melbourne (between Queen and Elizabeth Streets, close to Melbourne Central Station). All are welcome. We appreciate the generosity of the Welsh Church in hosting us.